We’re on the 5th day of Record Of The Day Week. It would be impossible for me to ignore one of the first records I discussed in front of a public audience. This past January, I was one of the guest panelists at Phonographic Memory, a record recollection series put on by KALW Sorceress “Wam Bam” Ashleyanne Krigbaum and Corey Bloom at Bernal Heights Library in San Francisco. Searching for something special I went with the profoundly unique Royalettes. These Baltimore natives recorded a bevy of Singles between 1963 and 1967. The core of their work was at MGM records under the aegis of Teddy Randazzo. A fan of sweeping, orchestrated landscapes that merged all threads of music into a soul/pop veneer, The Royalettes, like Little Anthony and The Imperials, were the biggest benefactor of his meticulous production style. Unfortunately for The Royalettes, it resulted in only one decent sized hit, “It’s Gonna Take A Miracle” in the Fall of 1965. 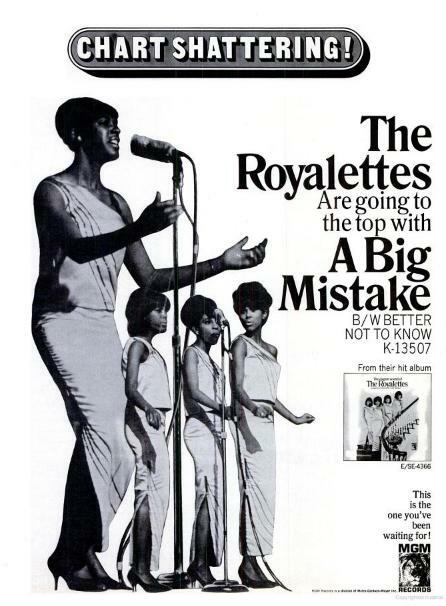 Nevertheless, The Royalettes recorded 2 LPs for MGM records, and the 2nd one is an overproduced masterpiece that rivals the complexity, nuance and bravado that Burt Bacharach brought to his work with Dionne Warwick. Although a number of the songs saw life as earlier efforts by Timi Yuro and others, this was one of the few times Randazzo sat down and recorded a full album with a group. It’s also one of those rare LPs in R&B, particularly for a Girl Group, that was recorded as a cohesive unit. Most R&B albums of the period glued together various sessions into potential masterpieces and more often than not failed. I chose this track as my favorite of the LP. A pensive jog of wanting to run away from circumstances, it blends the dream and delusion states one faces when reality smacks you right upside your head quite perfectly. Perfectly metered in its dramatics, it’s one of the best mini-movie skits in vinyl. If Oscars went to records, Sheila Ross and company should have won best heartbreak for 1966.